Truck Photos - DAF CF 85.380 Prime Mover with 33,000 Litre Fuel Tanker - Sri Lanka. DAF CF 85.380 Prime Mover with 33,000 Litre Fuel Tanker - Sri Lanka. Fuel Tank and Trailer manufactured in Sri Lanka by Dutch Lanka Trailers. Owner - Daya Ranasinghe, Nalinda Transport Service, Lanka Filling Station, Dambadeniya, Sri Lanka. Pic taken by by Nalinda Ranasinghe on 28 April 2010. Very nice - is the DAF a popular brand in Sri Lanka? Added by Fazer9553 on 21 November 2010. 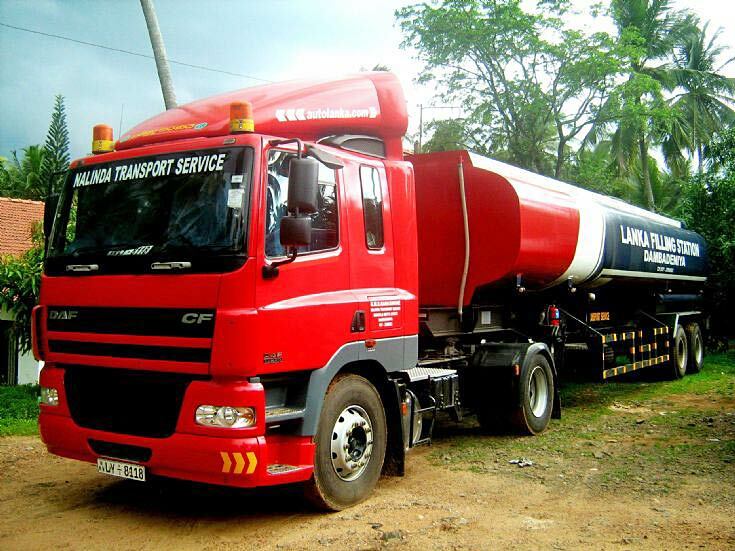 The colour of the fuel tanker resembles of the colour of PanUnited cement. Added by Asher Ng on 29 June 2014. Added by Mr. supun. Mata. Wikunnanna. Thenawanam. Me. Numbar. Akata. Wats app. Karanna. Puluwanda. 00821024309144 on 26 January 2019.